Vanguard by definition is a military term that means the action of people doing something that is at the forefront of an action or movement. Vanguard Wine Bar [bar a vin] fits this definition to a capital V as in victorious. 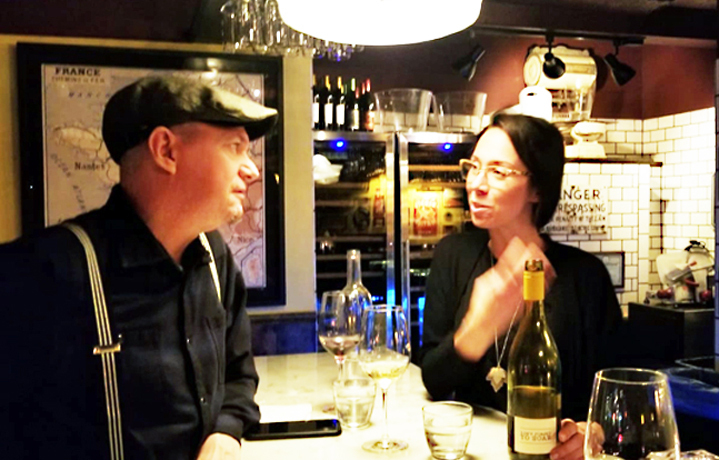 I recently visited Vanguard at their newest location in The Theatre District and met up with Macry (above), a wine expert and gracious host. The Vanguard wine list features wines from Bordeaux, France to Paso Robles, CA; Burgundy, France to The Finger Lakes, NY. Following is what I discovered. 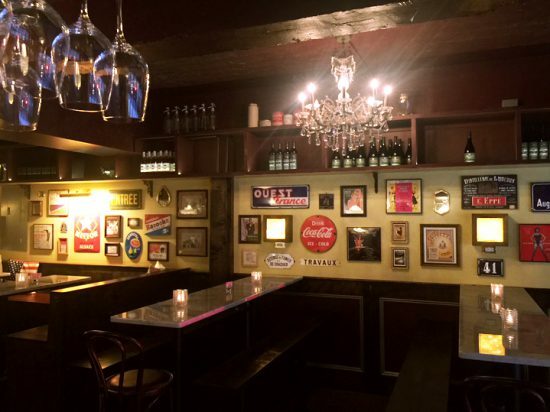 Retro ads and nostalgic memorabilia from both the U.S. and France adorn the walls at this 51rst Street establishment neighboring The Gershwin Theatre near Broadway. The decor is a blend (wine pun intended) in the spirit of both of our red, white and blue countries. The ambiance is as tranquil as an obscure bistro on a cobblestone alley in Paris, while the electric chaos of Times Square is just a few steps away. White subway tiles line the walls at the bar with charcoal black trim and pillows with our country’s flags rest on the dining area banquettes. Vintage cookware, an antique jukebox and LPs from various recording artists pepper the room. The dining area is L-shaped with high-top seating and a sole crystal chandelier that shines like a beacon accentuating the most important part of the space — shelves of wine. The wine menu is concise and non-intimidating even for the Cabernet, Pinot Grigio and Chardonnay drinkers. There is no pretense here and the selection will be described with several suggestions from their experts. For red wine, the menu includes descriptions from mild mannered, to bold, to fruit-forward and earthy and spicy blends. 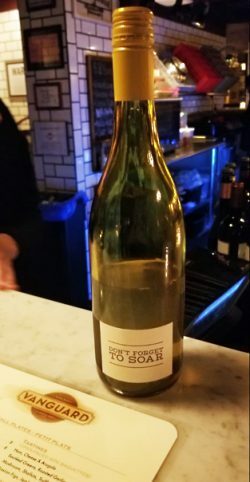 Macry suggested the “Don’t Forget to Soar” from Southhold Farm and Cellar in Texas. It’s a juicy wine and a must-try. The small plate menu includes snacks, tartines, salads, meat and cheese platters, just to name a few. Choices range from Smoked Almonds, Open-faced Mini Baguettes, Pot of Pickles, Caviar Trio and Small Flat Bread Pizzas. The dishes are small but not scrawny. I recommend their Arugula, Walnut & Grape Salad (above) with blue cheese and Champagne vinaigrette. 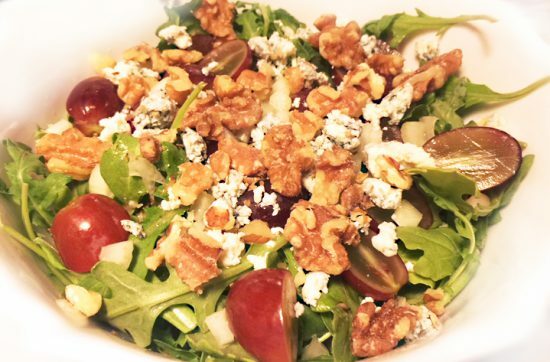 Fresh and healthy this salad has a perfect balance of leafy greens, fruit and nuts. 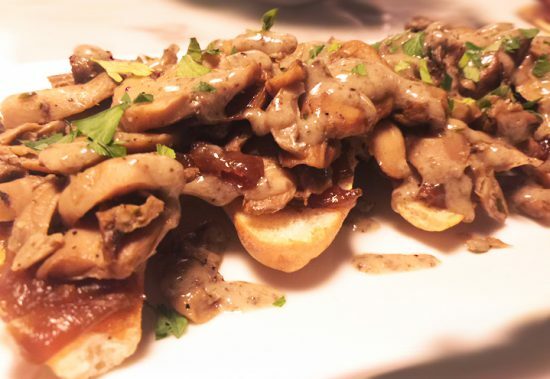 Aromatic and mouthwatering, the Mushroom with Shallots and Truffle (above) is just one of Vanguard’s open-faced mini baguettes. A waft of the “shrooms” announced the coming of this delicacy. I enjoyed the dish with gusto while my dinner companion raised her nose and refused to even taste it. If fungi is not your thing, you may want to indulge with their White Bean Hummus or the daily selection of American and French meat and cheese platter. 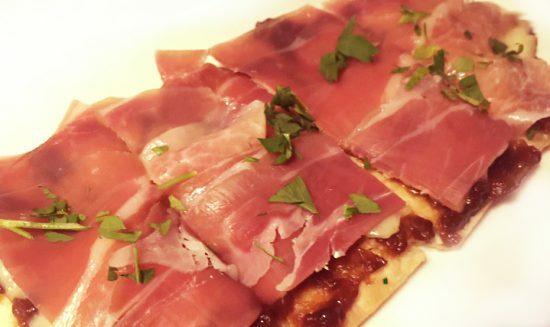 The Ham, Onion and Gruyere Flatbread Pizza is on par with jamón serrano or prosciutto with savory flavors that aren’t too salty along with crispy bread that only New York water can produce. In one word, delicious! 1). Sweetness – If the wine is not sweet, it’s considered dry. Dry red wines often have up to 0.9 grams of sugar such as inexpensive cabernet sauvignon. 2). Acidity – The tartness of the wine. This is often confused with the alcohol content. Rub your tongue on the roof of your mouth and it feels rough, this will determine a high or low acidity level. 3). Tannin – How bitter or astringent is the wine? Not to be confused with un-sweet, tannin makes the sides of your mouth and tongue dry. 4). Alcohol – Wines that are bolder tend to be higher in alcohol. Wines that are lighter-bodied tend to have lower alcohol content. With other locations in Kip’s Bay, Upper West Side and the Upper East Side, Vanguard is popping corks and dishing up tasty bites throughout NYC. I suggest you stop in on date night, after work or pre/post theatre. No reservations are required. Read City Pulse every month for the latest in what’s happening in and around New York City. Talk about a neighborhood favorite. Situated unassumingly on amsterdam, VWB is packed with locals. 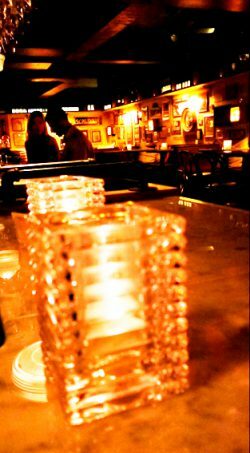 Good, buzzy vibes with great priced wines by the glass and typical wine bar food. Recommend, and will be back when I m back in the area.